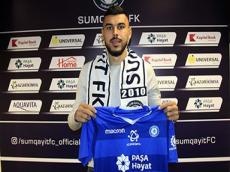 Sumgayit FC has made the second transfer of winter break. Report informs citing the official website of the club that Sumgayit included Adil Nagiyev who left Zira FC to the squad. The 1.5-year contract has been signed with the 23-year-old defender. His new uniform number will be 5. Zira in turn, included Bakhtiyar Hasanalizade who left Sumgayit to the squad. Also 1.5-year contract was signed with him. His new uniform number will be 14. Notably, Sumgayit attracted goalkeeper Rashad Azizli from Neftchi. Bakhtiyar Hasanalizade is the first transfer of Zira.